東日本大震災から2年...岩手・大槌みらい新聞の記事が英訳され電子書籍に :: E-book Published: "Life after the Tsunami vol.1: A Collection of The Otsuchi Mirai Shimbun News Reports"
Today marks the 2-year anniversary of the 2011 Tōhoku earthquake and tsunami. We need to remember what happened -- so we can learn from it, no matter where we are. 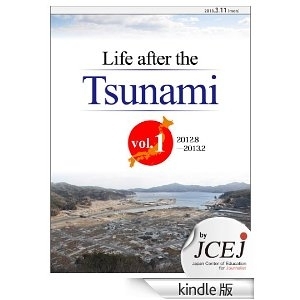 On this important day, the Kindle e-book, which contains the first person tsunami account I translated last month, has been published on Amazon.co.jp. The e-book contains Mr. Usuzawa's article as well as other personal accounts and reconstruction news stories from Otsuchi, Iwate. You can check out the e-book from here (Amazon Japan). Here is the link to the Amazon listing in the U.S. There are still numerous issues to be solved. (e.g. A large number of evacuees still live in inadequate temporary housing, etc.) Yet, when I see someone like Mr. Usuzawa, who is postively trying his very best to work with those around him for reconstruction of his community, I feel encouraged. I have to admit, it is a bit embarrassing that I am being encouraged by the people who survived the disaster; I really didn't suffer personally except for my family going through it. It is often frustrating I can't go there to help, but on this day I'd like to send my "ganbatte kudasai" prayers as well as thanks for the positive inspiration.